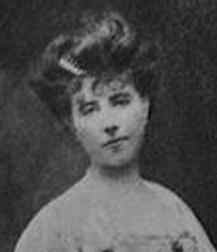 Elizabeth, Countess Russell (formerly Elizabeth Gräfin von Arnim) (August 31, 1866 - February 9, 1941) was a British novelist and, through marriage, a member of the German nobility (Mary Annette Gräfin von Arnim). Born Mary Annette Beauchamp in Sydney, Australia, she was raised in England and in 1891 married Count Henning August von Arnim, a Prussian aristocrat, and the great-great-great-grandson of King Friedrich Wilhelm I of Prussia. She had met von Arnim during an Italian tour with her father. They married in London but lived in Berlin and eventually moved to the countryside where, in Nassenheide, Pomerania, the von Arnims had their family estate. The couple had five children, four daughters and a son. The children's tutors at Nassenheide included E. M. Forster and Hugh Walpole. In 1898 she started her literary career by publishing Elizabeth and Her German Garden, a semi-autobiographical novel about a rural idyll published anonymously and, as it turned out to be highly successful, reprinted 21 times within the first year. Von Arnim wrote another 20 books, which were all published "By the author of Elizabeth and Her German Garden". Count von Arnim died in 1910, and in 1916 Elizabeth married John Francis Stanley Russell, 2nd Earl Russell, Bertrand Russell's elder brother. The marriage ended in disaster, with Elizabeth escaping to the United States and the couple finally agreeing, in 1919, to get a divorce. She also had an affair with H. G. Wells. She was a cousin of Katherine Mansfield (whose real name was Kathleen Mansfield Beauchamp). Elizabeth von Arnim spent old age in London, in Switzerland, and on the French Riviera. When World War II broke out she permanently took up residence in the United States, where she died in 1941.